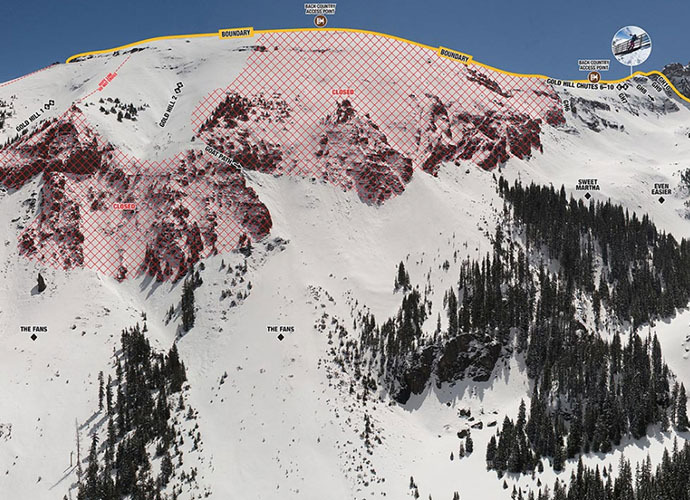 Telluride is home to some of the very best hike-to expert terrain in Colorado, and it's now even easier than ever to plan your off-piste adventures with their new aerial trail maps. 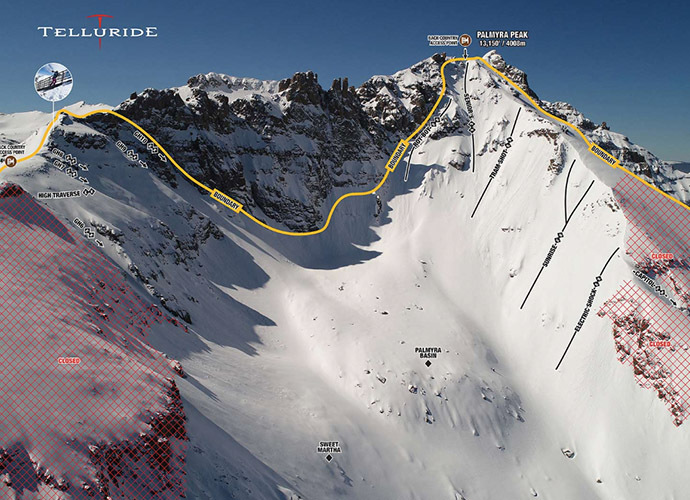 Make your ascent, pick your line, and enjoy fresh tracks virtually all season long. A signature area for in-bounds powder skiing, this upper-mountain terrain, accessible via the Prospect Lift and a short hike out along Prospect Ridge. Skiers can enjoy over 1000 vertical feet in the number of couliors, European-style faces, open glades and chutes. Hike between 10 - 30 minutes, dropping in anywhere along the ridge into trails such as Westlake, Lakeview, Dihedral Face, and Jello's Bowl. Those familiar with the Revelation Bowl & chairlift hail these amazing chutes as some of the best in-bounds sking for experts. Gold Hill Chutes 1 and 2 can be easily access through the gate at the top of Revelation Bowl Lift, or via a short traverse along Gold Hil access road. The incredible views are almost as breathtaking as the 1900 vretical descent. Chutes 6-10 requires a little extra effort with a hike further along the access road, but the bridge and staircase are memorable, and the descent into Palmyra Basin are perfect for those seeking a white-knuckle experience. Note: these chutes are only open when conditions allow, so always check the status before making the hike. For those seeking to well and truly earn-their-turns, the 1.5 hour hike to Palmyra Bowl is highly rewarding. Considered some of the most spectacular in-bounds terrain in the country, skiers are spoilt with over 200 acres and almost 2000 vertical feet on the north face of Palmyra Peak (13,320 feet). Accessed by the Prospect Lift, runs such as Tram Shot, Sunrise, and Electric Shot funnel skiers into Lower Palmyra Ridge, leading back into Black Iron Bowl (cue powder laps!). A favourite among local skiers, Bald Mountain's hike-to terrain is home to the best quality and longest lasting powder snow on the mountain. A short 20 minute hike via the access gate located on Upper Galloping Goose sends skiers to memorable runs including Jackpot and Audrey. Don't miss the stunning views of the surrounding peaks and small mining towns in the valley below. Note: the gate to Bald Mountain closes at 2:00pm daily, so head up there early. Remember... extreme terrain is for Experts Only. You may encounter cliffs, very steep slopes, rocks, challenging hikes, exposed traverses, and other hazards. Stay Safe! 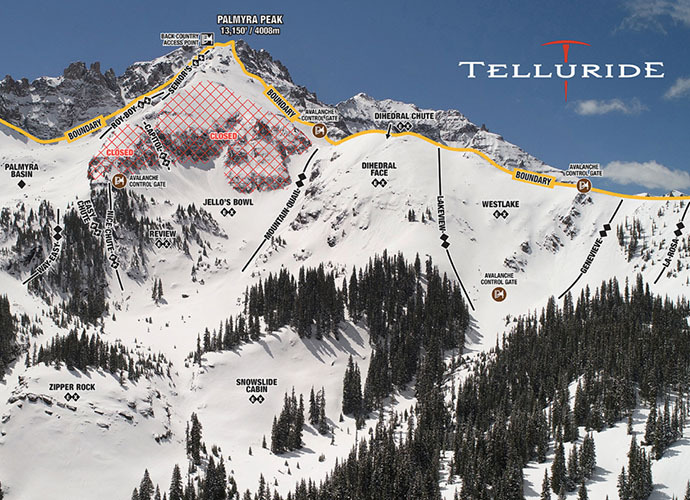 Aerial Photos: Telluride Mountain Resort.